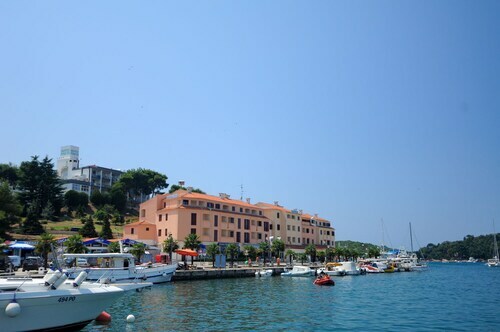 Offering direct access to the beach, this Porec hotel is within 2 mi (3 km) of Spadici Beach, Porec Marina, and Church of Our Lady of the Angels. Decumanus Street and Basilica of Euphrasius are also within 2 mi (3 km). Nestled on the beach, this Rovinj hotel is within 3 mi (5 km) of Rovinj Aquarium, Church of St. Thomas, and Franciscan Monastery. St. Euphemia's Church is 3 mi (4.9 km) away. 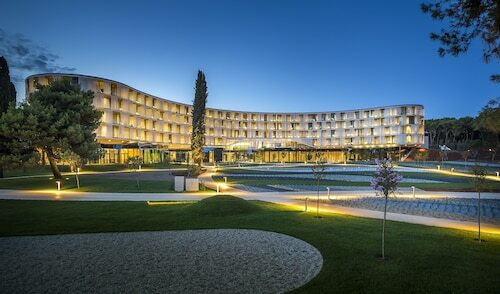 This family-friendly Pula hotel is within a 15-minute walk of Pula Aquarium and Punta Verudela Beach. Pula Arena and Forum are also within 3 mi (5 km). Located in Rovinj, this beachfront hotel is in a provincial park and within a 15-minute walk of Park forest Zlatni Rt, Rovinj Marina, and Romanesque Church of the Holy Trinity. Church of Our Mother of Mercy and Carrera Street are also within 15 minutes. 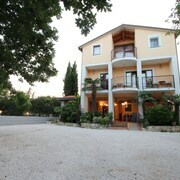 Situated in Pula, this bed & breakfast is within a 15-minute walk of Arch of the Sergians and Forum. Pula Arena is 0.8 mi (1.2 km) away. Pula Station is 24 minutes by foot. 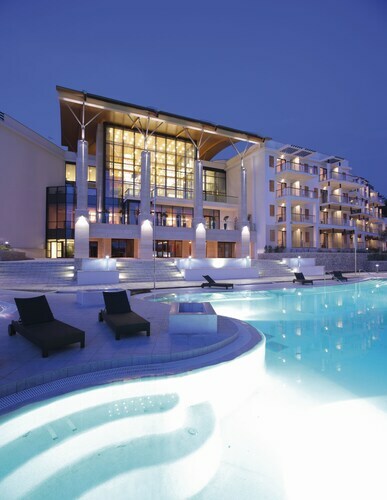 Nestled on the beach, this Pula hotel is within 3 mi (5 km) of Pula Aquarium, Pula Arena, and Forum. Punta Verudela Beach and Fort Bourguignon are also within 1 mi (2 km). 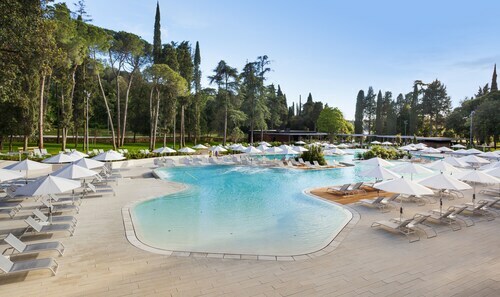 Located in Rovinj, this beachfront hotel is in a regional park and within a 15-minute walk of Park forest Zlatni Rt, Rovinj Marina, and Romanesque Church of the Holy Trinity. Carrera Street and Church of Our Mother of Mercy are also within 15 minutes. This family-friendly Vrsar apartment building is located on the boardwalk, within 1 mi (2 km) of Vrsar Harbour and Dusan Dzamonja Sculpture Park. Dinopark Funtana is 1.9 mi (3.1 km) away. 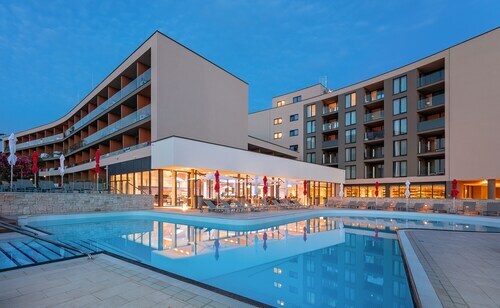 Located in Rovinj, this beachfront hotel is in the city center and within 1 mi (2 km) of Park forest Zlatni Rt, Rovinj Marina, and Rovinj Harbour. Church of Our Mother of Mercy and Romanesque Church of the Holy Trinity are also within 1 mi (2 km). This family-friendly Umag hotel is located near the airport, within 3 mi (5 km) of Port of Savudrija and Savudrian Lighthouse. Katoro Beach and Umag Beach are also within 6 mi (10 km). 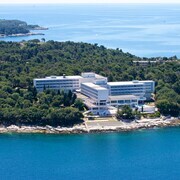 Situated by the sea, this luxury hotel is 0.9 mi (1.4 km) from Naval Cemetery and within 3 mi (5 km) of Pula Arena and Forum. Fort Bourguignon and Arch of the Sergians are also within 2 mi (3 km). How Much is a Hotel Room in Istria? 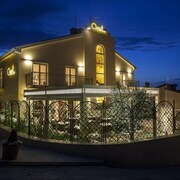 Hotels in Istria start at $64 per night. Prices and availability subject to change. Additional terms may apply. Pack your bags—it’s time to embark on a getaway. 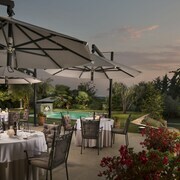 Whether you’re craving a solo retreat or promising your family a vacation to remember, book one of the best hotels in Istria. These hotels are located within easy access of the city’s hottest attractions and entertainment, so you won’t miss a beat while you’re in town. Spend the days exploring the local landmarks and the evenings getting to know the nightlife. After exploring the city from top to bottom, rest up at a hotel that speaks to you. Find the perfect place that matches your trip’s vibe, from a trendy boutique to family-friendly accommodations. Allow us here at Travelocity to pair you with up Istria hotels that suit your vacation preferences. Discover places with convenient on-site restaurants, around-the-clock service, and pools where your kids can make a splash. Some hotels may boast fitness rooms and spa services, while others feature game rooms and Wi-Fi access. To top it all off, you’ll score cheap hotels in Istria that let you spend more on your activities and less on your lodging. Book and bundle your flight and hotel deals together today and save up to $537. It’s time to explore a new city, and break out of your routine. Umag is charming small town located on the west side of the Istrian coastline. Very nice hotel,tasteful and luxury.This year it's completely renovated and now have 5 stars. I can recommend it to everyone. The rooms are spacious, and well decorated, there was pool below our window and sea is just about 50 meters away. You should taste seafood and the native meals there ... they are very delicious. The service was great, The Pool is awesome but the rooms are too small, There was three of us and there was no room for us to move around, the beds were uncomfortable. I was not happy with my room.